Do you remember what it was like to play in the sandbox as a kid? After you took your shoes off the grains of sand would be plastered around your feet and toes? When I was a kid, the surface of the playground at my daycare and local park were covered with sand. I remember digging in it, feeling slow as molasses when I ran across it, and how it cushioned my landing every time I landed in it after sliding down the slide. I also remember fondly the mounds of sand I dumped from my shoes and socks as some sort of measure of how hard I’d played that day. As a kid playtime was just fun and games to me; as an adult I now know that I was learning important lessons during that time. Unstructured play is vitally important for a child’s development, helping children build foundational physical, emotional, social and intellectual skills they need to thrive. As adults we have to remember that learning isn’t just reserved for the classroom. While it’s true that children can play anywhere and with anything, playing freely in the natural world with natural materials helps encourage more active, imaginative play outdoors that enhances their curiosity. It helps them establish a sense of place (or place attachment) and connection to nature, which makes them more likely to be conservation stewards in the future. And, kids that get regular interaction with nature are more likely to be healthier, happier, and perform better in school. Nature play and learning spaces help children begin to understand the workings of the world around them and learn by engaging with and manipulating natural elements through sensory (sight, sounds, smells, touch), fine motor and gross motor experiences. Natural playscapes contain mainly natural materials like trees and other plants, water, sticks, sand, stones, dirt, logs, etc. that encourage manipulation and discovery. Natural play elements created with the use of these materials include sandboxes, sensory gardens, mud kitchens, hill slides, and nature build zones with loose parts, to name a few. 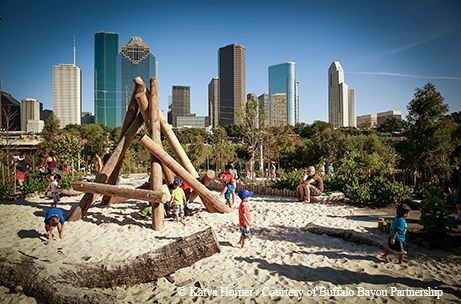 Nature preschools and kindergartens are taking off across the United States and Texas, as well as nature play sites in nature centers, zoos, and parks. Nature play guidelines have been created to help guide parents, schools and park administrators for installing safe and manageable natural play and learning environments. Find more places to play, explore and connect with nature in your community at NatureRocksTexas.org.